Dog Eared Publicity: Cover Reveal: Here Comes the Bride by Alexandra Ivy, coming November 17! 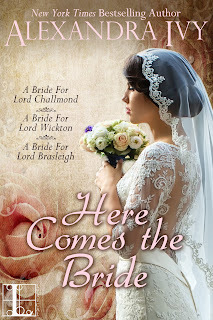 Cover Reveal: Here Comes the Bride by Alexandra Ivy, coming November 17! A BRIDE FOR LORD WICKTON Barth Juston, Earl of Wickton, assumes a woman would be grateful to accept an arranged marriage with him. What a shock that beautiful Isa Lawford is not! In fact, she insists she prefers someone else! Now this overconfident lord is about to enter the most perilous battle of all: a fight for a woman’s heart . . .
A BRIDE FOR LORD CHALLMOND Simon Townsled, Lord Challmond, is off to his Devonshire country estate, where he is sure to be safe from feminine wiles. But he doesn't count on feisty do-gooder Miss Claire Blakewell—who is as determined to march down the aisle as he is to avoid it . . .
Like most writers, I was born with an avid love for reading. Growing up in a small town in the Midwest, I can’t remember a time when I didn’t have a book in my hand or wasn’t dreaming up wild stories in my head. And when I stepped into my local library for the first time I thought it was paradise. There were so many books on the shelves I didn’t know where to start!